I'm an upcoming freelance writer living in the Headingley area of Leeds. Hope you enjoy reading my articles! SWIM ANYONE! Well what can I say? This new swimming pool, steam room and sauna is possibly one of the most impressive public swimming facilities in Leeds. 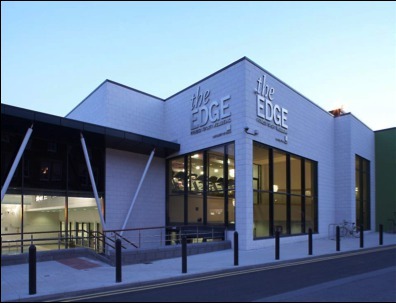 The pool is just one of the sport facilities on offer in the Leeds University owned EDGE Sports Centre and also has complete disabled access. The admission price varies depending on your membership and what time you decide to go, however as an external member of the public you can expect to be charged a very reasonable £5 per swim. This large pool is 25m in length and is usually divided into 8 lanes. Despite having a family period at the weekend it attracts a high number of reasonably serious swimmers. One of the tricks up the sleeve (or should that be swimming shorts) of this pool is that they use a state of the art UV system which in English means that they only need to half of those nasty chemicals in the water and that the water stays a sparkling clear blue. The second trick of this urban paradise, and the definite winner for me, is that they boast a steam and sauna room right next to the pool so that you can sit and sweat all you troubles away. To top it all off, the swimming pool is surrounded on three sides by glass-panelled walls, which floods the space with natural daylight. See the web link below for more information regarding swimming lesions for adults and kids, times of aquatic classes and the overall pool timetable. I could go and on with how good a facility this swimming pool is, but I think you get the idea. If you like swimming then this is the place to be, and even if you don't like swimming, I would still seriously recommend a visit, you might just change your mind when sat in that steam room! We are glad you enjoyed your time at The Edge Liam! Just to let everyone know we have a number of membership/pay as you go options for both students and staff of the UOL as well as great value options for members of the public. As well as the swimming pool Liam enjoyed using we also have a state of the art fitness suite, an extensive class timetable, squash courts, sports halls and of course our excellent climbing wall.